marital bless: Well, it's that time again . . . Deer hunting that is. Opener was last weekend, but we allow the family who's farm we crash to have full opportunity to nab the first deer. Due to the warm fall we've been having and the poor weather conditions last weekend, the harvest was 17% below average. Experts are saying that the numbers indicate a larger harvest this weekend, but that over all we will be below projected numbers. I know that my hunting may offend a number of you readers, but really, it is a necessity. Without natural predators to keep the deer population at a number that the woods can feed, the two options are starving deer or death by vehicle. I don't think there is a Minnesotan who doesn't have a relative or friend that has experienced hitting a deer, or hitting one themself! Additionally, we love venison and make full use of it! Steaks, sausage, jerky, it's all good. I don't know why I feel the need to defend myself, as hunting is a tradition that I have known my entire life. For example, in celebration of my birth my Dad bought me a .20 gauge shotgun. Yeah, I know. Crazy. The companionship and stories told while hunting always make the time enjoyable. In fact that's why I keep going out, seeing as how I haven't shot a deer in 7 years! I love that it is something I can enjoy with my Dad, brother and Tony. It's very unique I think and extremely special to me. However, as I've gotten older, I have a much harder time getting out into the woods with three of the men most dear to my heart. I wouldn't hunt with them if I didn't think they were extremely safe hunters, and we hunt on private property, surrounded by private property, but accidents are accidents. Unfortunately accidents while hunting are also deadly. When I was younger I'd say my prayers were 70/30, please let me shoot a deer/safety related. Now I'd say my prayers are 90/10, safety/it'd be nice to see a deer. So again, I'm asking for prayer. Just keep us in mind this weekend and for that matter all hunters in general. 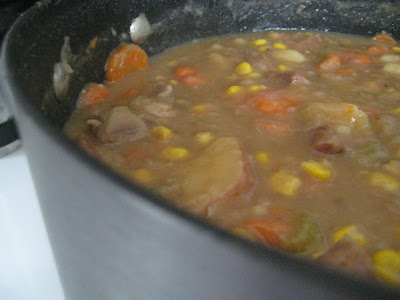 I'll leave you with a semi crappy pic of the Belgian Stew I made for the weekend! PS. My dear Rachel aka Maydaygirl is being induced tomorrow! I'm so excited and will be praying for her delivery! Praying for a safe trip this weekend! Have fun! "Honey, I have to pee." "Babe, when are we going to see something?" I'm not sure that I could actually pull the trigger, but I am not against hunting in the least--if the animal serves its purpose of food. I can't stand it when I hear stories of hunting for sport and then not butchering the animal and putting it's body to use. Have fun, stay WARM and SAFE! Erica, you bring up a very good point! We love venison! Steaks, sausage, jerky, you name it! Even though I'm not a hunter and don't think I could ever do it, it's not something I'm completely against. Growing up in Wisconsin (even Milwaukee) hunting is just something most people around here do. I went to school in Eau Claire and making that drive home to Milwaukee at night in the fall were some of the scariest times ever! I can't tell you how many deer I've seen poking out from the side of the road ready to jump in front of my car! Good luck and have a safe, accident-free trip! found your blog recently and keep visiting back:) congrats on your pregnecy! what a blessing:) I cant wait to start a family! love your blog! it is darling! I think it's cool that you hunt, actually! My dad hunts and deer season is usually a time when he can get away with the boys for a few days. hope you guys get a deer! I LOVE Venison and I actually think it's very cool you know how to do that! I don't think I could actually shoot one, but I don't mind the benefits! Have fun! I grew up in a hunting family. It was never my thing, but neither is fishing. I think it's the "patience" part I have trouble with. The nature part I love. :) Anyway, this would be a good time to mention the HUGE buck I saw in Minnetonka on my way to work yesterday morning. I probably could have ridden him, he was so big! Was about 4:30 in the morning and he just moseyed across the road and didn't care that I was there. I've never thought of hunting, but it's something you enjoy, then more power to ya Leah! That's all that matters. I've never tried deer, but my puppies love ANY deer treats! LOL! I went hunting with my dad and brothers just once. I think I was 14 and appalled that I couldn't shower and then they wanted to put deer pee on me. No Thank You! While it was somewhat fun, not a fan of the cold either, I never went again. I also don't think my dad has gotten a deer in 14 years so don't feel bad about 7! Mmmm...I love venison jerky. It's my favorite. And the venison sticks too! YUMMY! I, myself, am not a hunter (I wouldn't be able to stay quiet all day long! )..but my brothers, dad, uncles, cousins, etc. go every year, so I get my stash of meat from them! Good Luck in the hunt! Hope you had a great time. My hubs is going next weekend. He's on a mission to get a deer. He keeps telling me he needs to feed the family - what he doesn't realize is Cub Foods is 10 mins away.